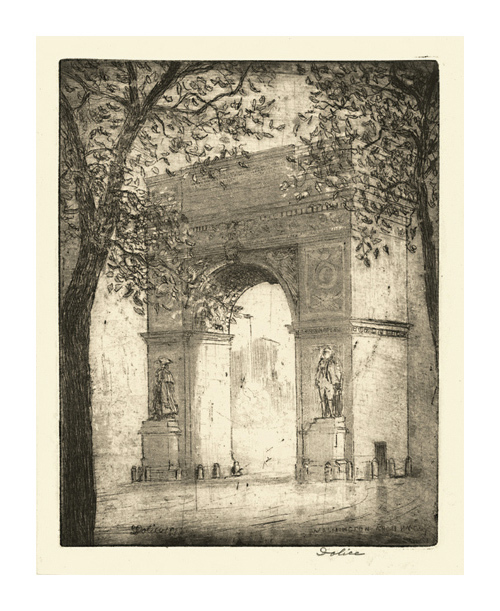 Washington Square Arch, New York City- - 1922, Etching. Edition 50. Signed in pencil. 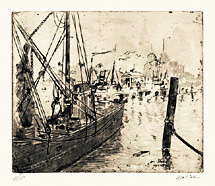 Signed, titled and dated in the plate, lower right. Image size 9 1/2 x 7 5/16 inches (241 x 186 mm); sheet size 10 3/4 x 8 1/2 inches (273 x 216 mm). 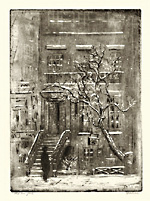 A fine, atmospheric impression, with selectively wiped platetone, on cream wove paper; full margins (1/2 to 3/4 inches), in excellent condition. 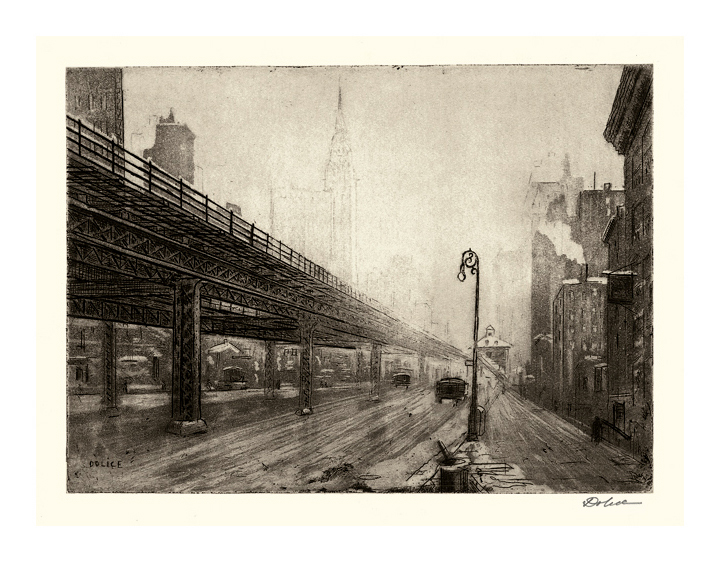 Old New York- - 1929, Etching and Aquatint. Edition not stated. Signed and titled in pencil. 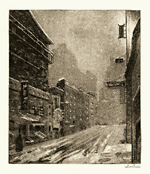 Signed in the plate, lower left; annotated Lexington Ave and dated, lower right. Image size 9 5/8 x 6 7/8 inches (244 x 175 mm); sheet size 12 1/8 x 9 1/4 inches (308 x 235 mm). A fine atmospheric impression, with selectively wiped platetone, on cream wove paper; full margins (1 to 1 1/2 inch), in excellent condition. 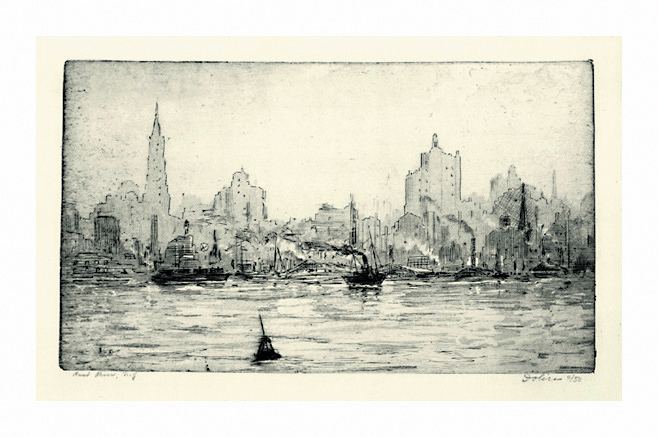 East River -- c.1930, Etching. Edition 50. Signed, titiled and numbered 4/50 in pencil. Image size 5 15/16 x 10 3/16 inches (151 x 259 mm); sheet size 8 11/16 x 11 3/4 inches (221 x 299 mm). A fine impression in dark blue green ink, on off-white wove paper, with full margins (3/4 to 1 1/2 inches), in excellent condition. 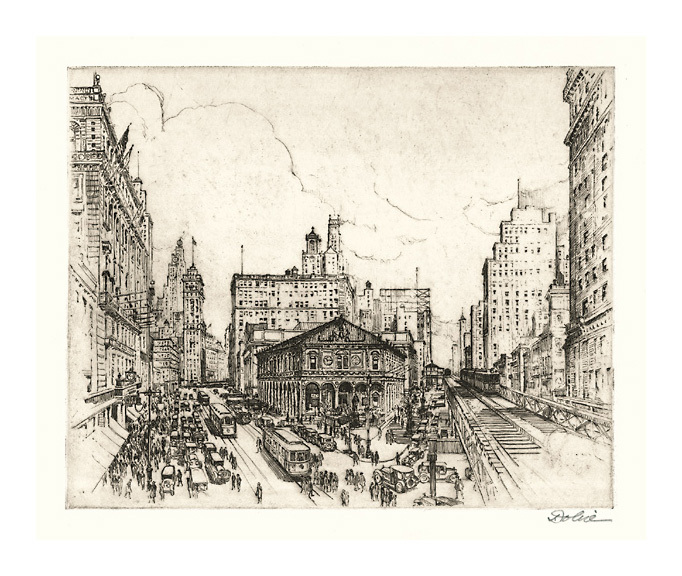 Herald Square- - 1932, Etching and Aquatint. 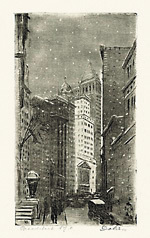 Image size 7 7/8 x 9 7/8 inches (200 x 251 mm); sheet size 11 1/4 x 12 1/2 inches (286 x 218 mm). 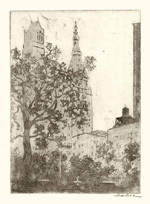 A fine impression, on cream wove paper, with full margins (1 1/4 to 1 3/4 inches), in excellent condition. 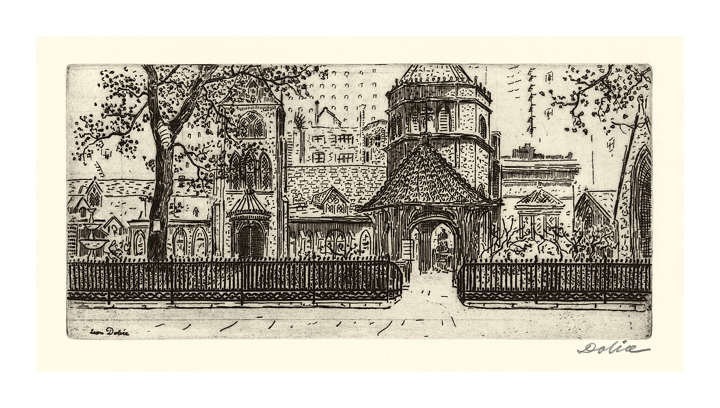 St. Mark's on the Bowery- - 1932, Etching and Aquatint. Edition not stated. Signed in pencil. Signed in the plate, lower left and titled, lower right. Image size 9 7/8 x 7 1/2 inches (251 x 191 mm); sheet size 13 1/8 x 10 inches (333 x 254 mm). A superb, richly inked, atmospheric impression, on cream wove paper, with full margins (1 1/8 to 2 inches), in excellent condition. 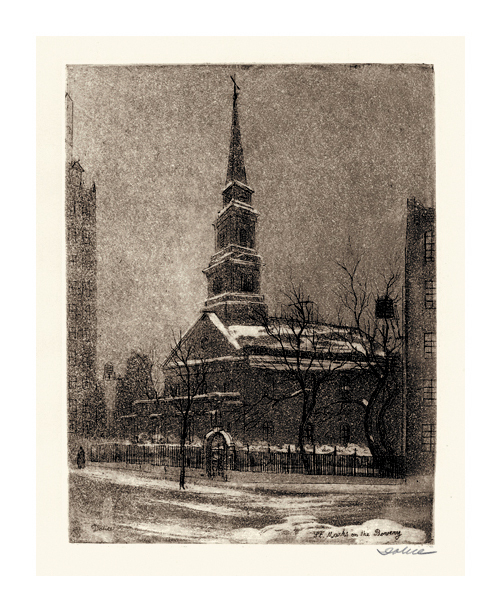 Little Church- - 1932, Drypoint. Image size 4 15/16 x 10 5/8 inches (125 x 270 mm); sheet size 10 1/16 x 13 3/16 inches (333 x 254 mm). A superb impression, on off-white wove paper, with full margins (1 5/16 to 2 11/16 inches), in excellent condition. 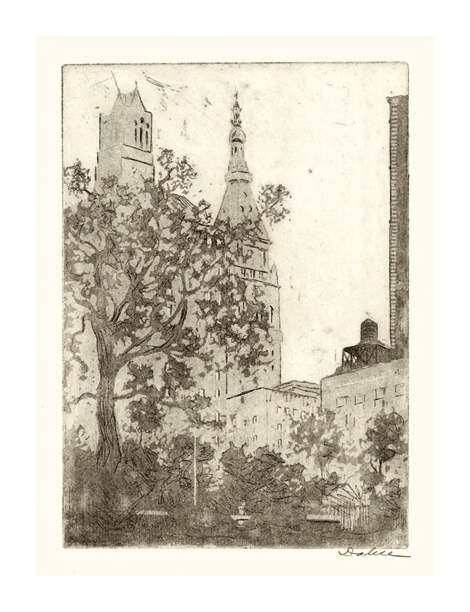 Gramercy Park- - 1932, Etching and Aquatint. Image size 9 7/8 x 6 15/16 inches (251 x 176 mm); sheet size 13 x 10 15/16 inches (333 x 278 mm). 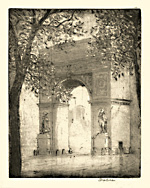 A fine impression, on off-white Johannot handmade paper, with full margins (1 5/8 to 2 inches), in excellent condition. 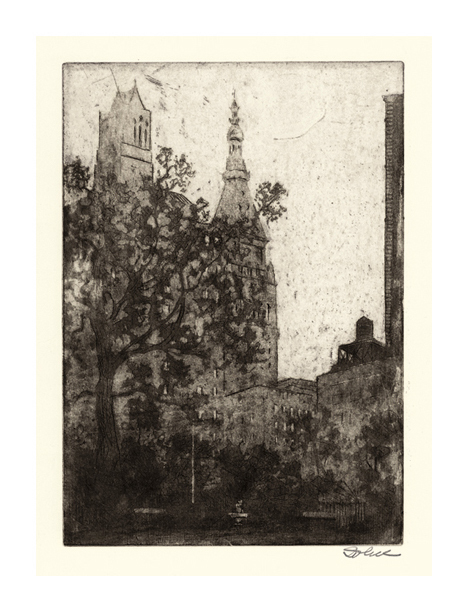 Gramercy Park-- 1932, Etching and Aquatint. Image size 9 7/8 x 6 15/15 inches (251 x 176 mm); sheet size 13 1/16 x 9 7/16 inches (332 x 240 mm). A fine impression, on off-white wove paper, with full margins (1 3/16 to 1 7/8 inches), in excellent condition. 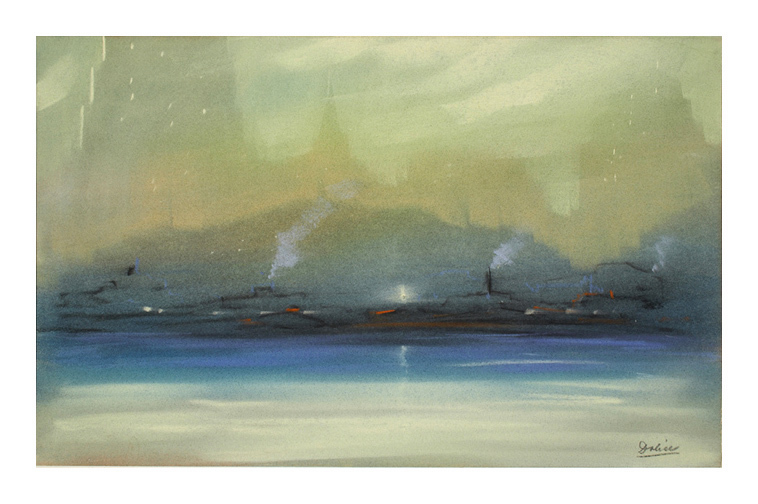 Untitled (Harbor Lights, NY)-- c.1935, Pastel. Signed in pastel, lower right. Image size 11 1/2 x 18 1/4 inches (292 x 464 mm); sheet size 12 x 19 inches (305 x 483 inches). A fine atmospheric work on heavy cream wove drawing paper, with full margins (1/4 inch), in excellent condition. 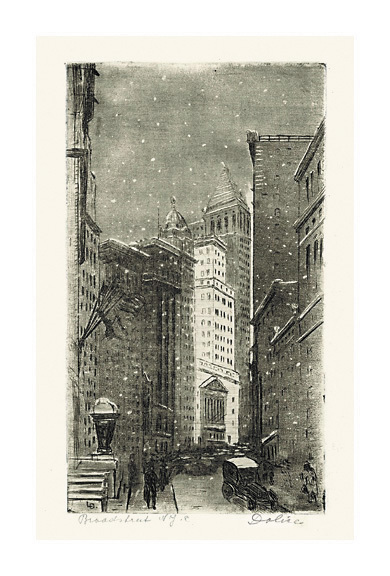 Broadstreet N.Y.C. 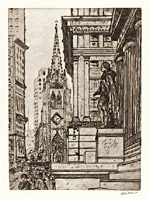 (Wall Street)-- c.1935, Etching. Edition not stated. Signed and titled in pencil. Initialed in the plate, lower left. Image size 8 3/4 x 4 15/16 inches (222 x 125 mm); sheet size 11 x 7 3/8 inches (279 x 187 mm). 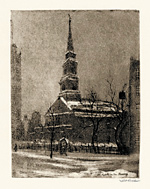 A fine impression, in blue/black ink, on cool white wove paper, with full margins (1 to 1 9/16 inches). Pale light toning within a previous mat opening, otherwise in excellent condition. 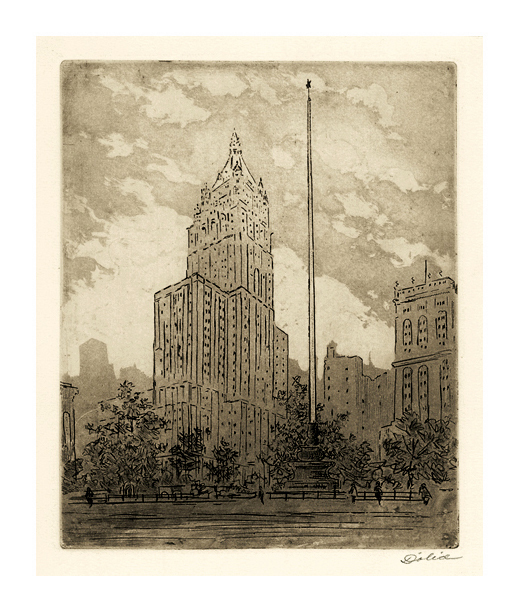 Madison Square- - 1938, Etching, Aquatint, and Drypoint. Image size 9 3/4 x 7 7/8 inches (248 x 200 mm); sheet size 11 x 9 inches (279 x 229 mm). 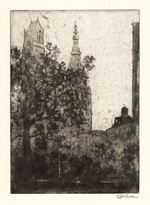 A fine impression, with selectively wiped platetone, on cream wove paper, with full margins (1/2 to 5/8 inches), in excellent condition. 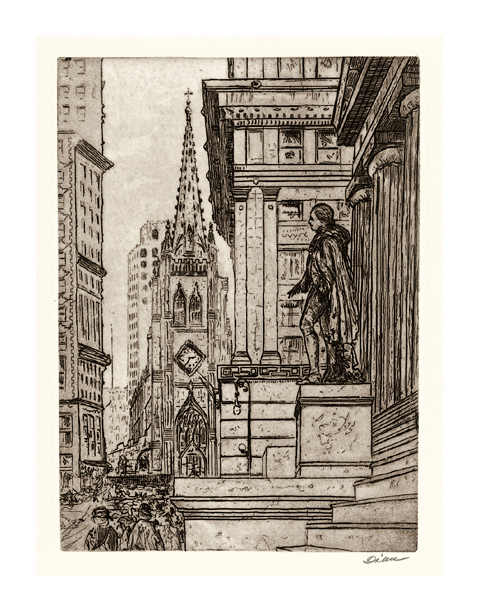 Wall Street-- 1939, Etching and Drypoint. Image size 10 15/16 x 7 7/8 inches (278 x 200 mm); sheet size 13 1/2 x 10 3/8 inches (343 x 264 mm). A superb impression, on off-white wove paper, with full margins (7/8 to 1 5/8 inches), in excellent condition. 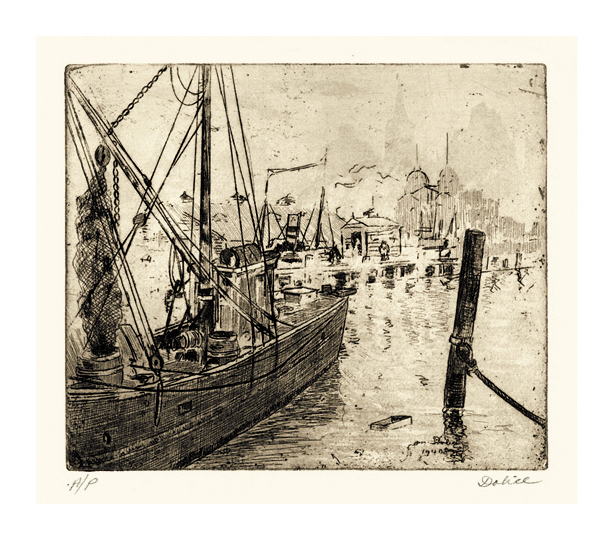 NY Harbor-- 1943, Etching, Drypoint, and Aquatint. Edition not stated. Signed and annotated A/P in pencil. Signed and dated on plate, lower right. Image size 9 7/8 x 8 13/16 inches (251 x 224 mm); sheet size 10 9/16 x 11 7/8 inches (268 x 302 mm). 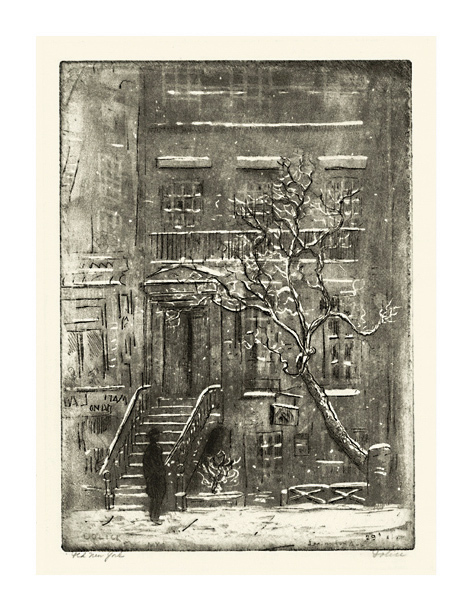 A superb proof impression, with rich burr on off-white wove paper, with full margins (1 1/4 to 1 7/8 inches), in excellent condition. 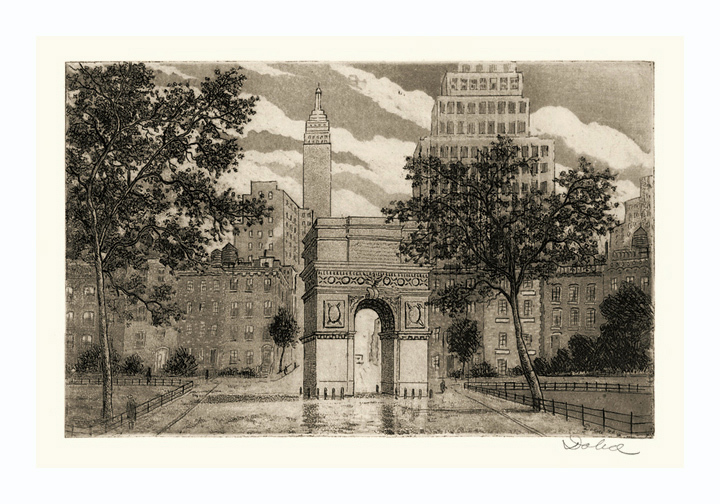 Washington Square- - 1948, Etching and Aquatint. Edition not stated. Signed in pencil. Numbered 4 in pencil on lower left sheet corner. Plate signed and dated on lower right. Image size 6 13/16 x 10 7/8 inches (173 x 276 mm); sheet size 9 9/16 x 12 3/16 inches (243 x 310 mm). A fine impression, on off-white wove paper, with full margins (1 3/16 to 1 9/16 inches), in excellent condition. 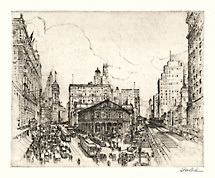 Third Avenue El-- 1951, Etching and Aquatint. Dolice 2. Edition not stated. Signed in pencil. Signed in the plate, lower left. Image size 7 11/16 x 10 5/8 inches (195 x 270 mm); sheet size 11 3/16 x 14 7/16 inches (284 x 367 mm). A superb, atmospheric impression, with rich burr and selectively wiped platetone, on off-white wove paper, with full margins (1 1/2 to 2 inches), in excellent condition. 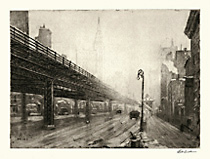 An image of the Third Avenue El looking north to the Chrysler Building. 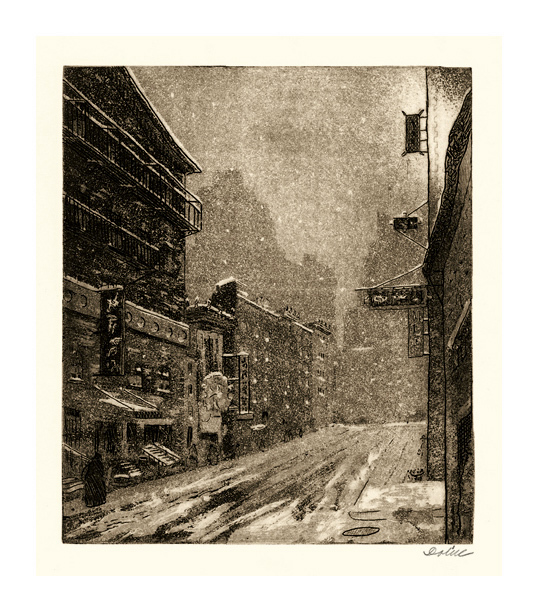 Chinatown -- 1951, Etching and Aquatint. Image size 9 7/8 x 8 3/16 inches (251 x 208 mm); sheet size 12 5/16 x 10 7/8 inches (313 x 276 mm). A superb, atmospheric impression, with rich burr and selectively wiped platetone, on off-white wove paper, with full margins (1 to 1 1/2 inches), in excellent condition. 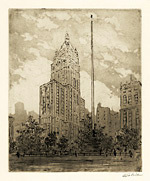 Cover illustration of Leon L. Dolice: Copperplate Etchings of New Yok City 1920-1951.